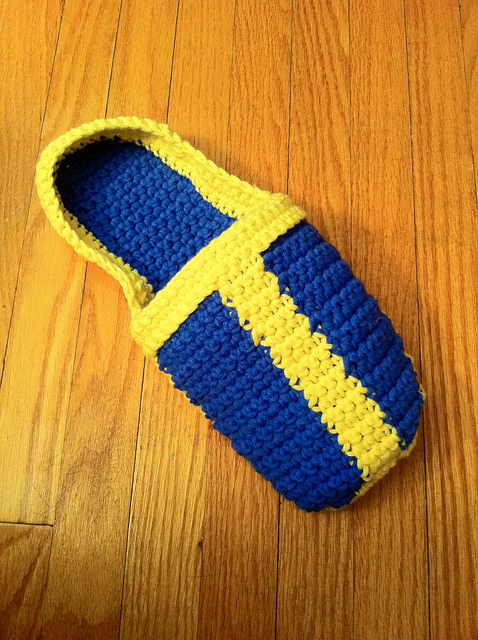 As mentioned in my last post, I’ve been working on making a pair of slippers for my husband in colours from Fallout, his favourite video game. It’s been a huge undertaking, since I couldn’t find any patterns that were the style he wanted that went up to size 13. The closest I could find was this pattern, which I’ve had to heavily modify. On top of all this, he wanted a hard sole. Geeze, the demands of those who don’t craft and have no idea how complicated the thing that they are asking for is. Well… I’m proud to say I’m finally done! The pattern to follow soon. In the meantime, I thought I would share how I made the soles. I also put the tutorial up on Instructables, where you can download it as a pdf. Make a template by tracing the outline of the person’s foot using the cardboard and pen. 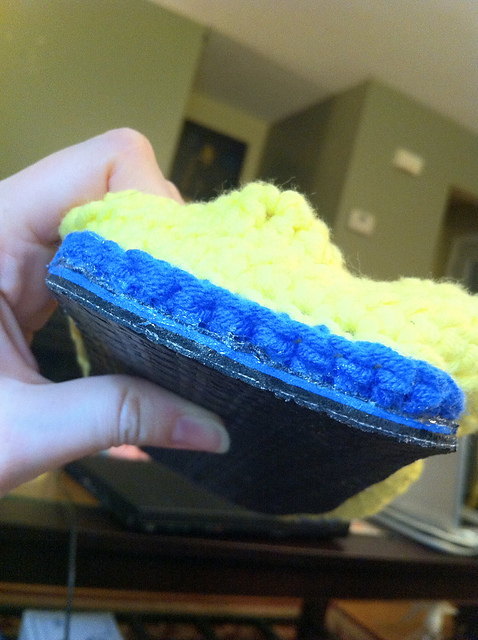 Compare it to the bottom of the actual slipper and make any necessary adjustments. Cut out your finished template and use it to cut out four pieces of craft foam, two pieces of PVC fabric, and two pieces of regular fabric. Pay attention to right vs. left soles as you do this. Essentially you are making a sandwich of PVC on the bottom (with the PVC side outwards so that it will be the very bottom of the sole, the part that makes contact with the ground), two layers of foam, and then the fabric layer on top. Between each layer is a liberally applied coat of Shoe Goo. I suppose other glues are possible, but I highly recommend Shoe Goo. It is designed specifically for shoes in that when it dries it is clear, solid and non-tacky, but still has some flexibility. Plus the hold is superior. Nothing is going to get your layers apart. It is not easy to work with however as it sticks to everything in its wet state. This is why I recommend using a popsicle stick to spread it. However I ultimately still ended up using my fingers at some points, so be sure to have a good hand cleaner present. Something like Fast Orange is ideal, but I got by with a dish scrubber and some dish soap. Give the sole a full 48 hours to dry and cure. That was a lot of glue, after all. 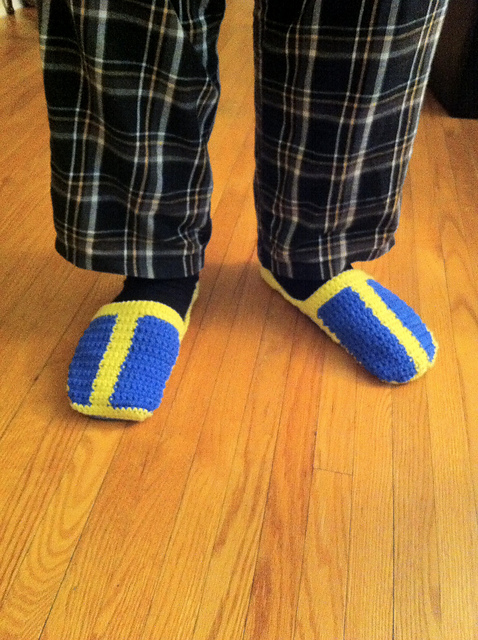 Then you can finally add the last layer – the slipper itself! Make sure you give it about 24 hours to dry and cure. It’s been awhile I know. I choose to blame several things: post-wedding craziness, the holidays, and some health problems experienced by both my husband and myself. This post is essentially just going to be a run-down of things I have been working on. It features some great patterns, including one I am writing myself (my first!). 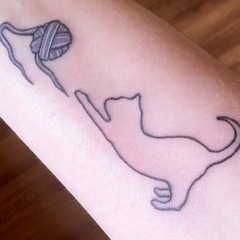 I guess that might be another reason for my lack of blogging: knitting addiction. I state where I got each of the patterns. To see which yarn(s) I used, click on the image to see a Ravelry description page. I’ll start off with the arm knitting trend. Despite my already large stash, I decided to buy some extra bulky yarn and give it a whorl. I used the tutorial here and followed the guidance of Unwind Yarn House in using Mirasol Ushya yarn held double. I’m pretty happy with the look of the result, albeit it’s not as warm as some of my other scarves, and I’m worried that getting a stitch snagged on something might cause the whole thing to be pulled out of shape. We shall see. Curious to see what arm knitting might possibly look like in progress? Voilà. PS: I entered this in the Ravellenic Games, which coincides with the Olympics. 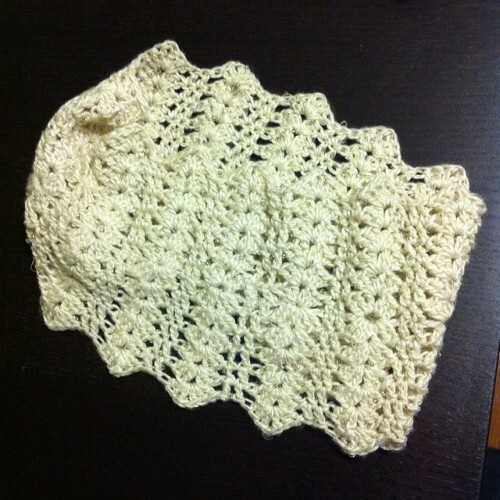 Before these I finished Shara Lambeth’s Dentelle Cowl for my mother-in-law. 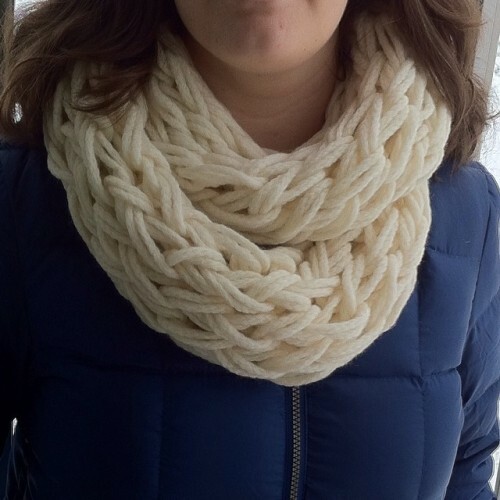 It’s a lovely short cowl, and I really like the finished result. Though I will suggest that if you plan on trying to make your own that you make the foundation chain very loose. The stitch pattern is very stretchy, plus you will be putting many dcs into the foundation chain, so it needs to be able to give a little. Being at that age where friends and cousins start having kids, I’ve also been doing some baby knits. 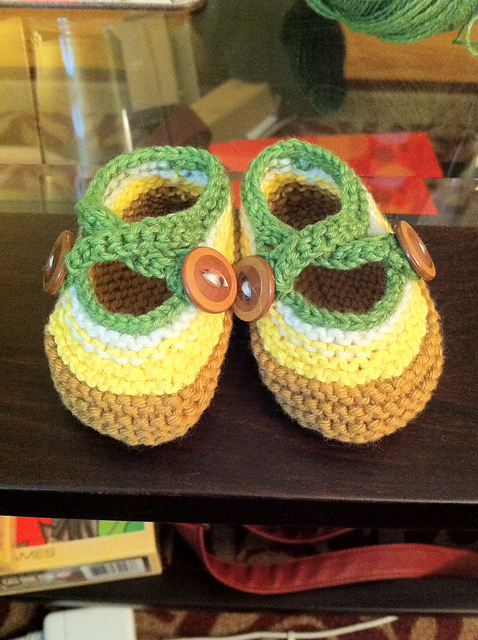 This adorbale pair of booties is based on a Saartje de Bruijn pattern. Albeit I used the seamless version by Fleegle instead, because I hate seams. Hate. I had to learn the Turkish cast-on it order to do it. I highly recommend FluffyKnitterDeb’s tutorial, it’s really easy to follow. A little tricky until you get the hang of it, but I’m glad I’ve learned how to do it. 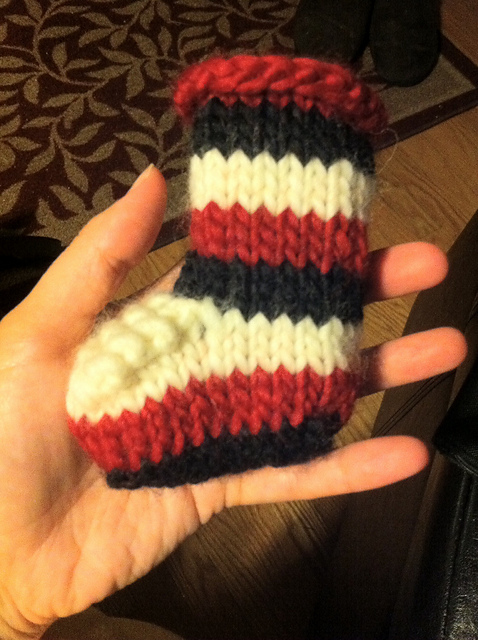 It makes beautiful sock toes, bag bottoms, mitten tips, etc. One of the babies was born in December. 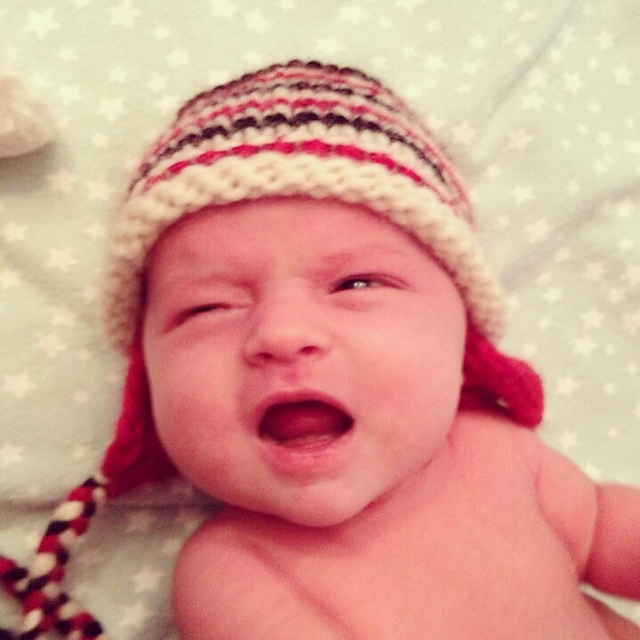 She of course required something more warm and snuggly, hence I made her a hat using the Bulky EarFlap Hat pattern from As the Bunny Spins and booties using Simple Soft Baby Booties from Adirondack Mama. She might not be so happy about wearing it, but I think her parents are glad she’s warm in these -20°C tempertures we’ve been getting. 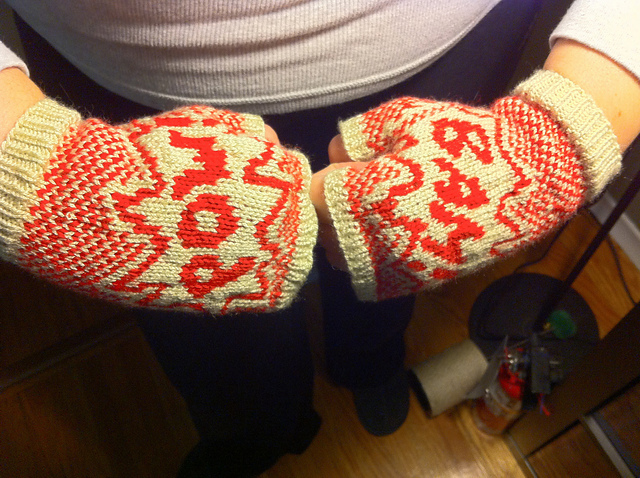 Then there was my Christmas knitting. 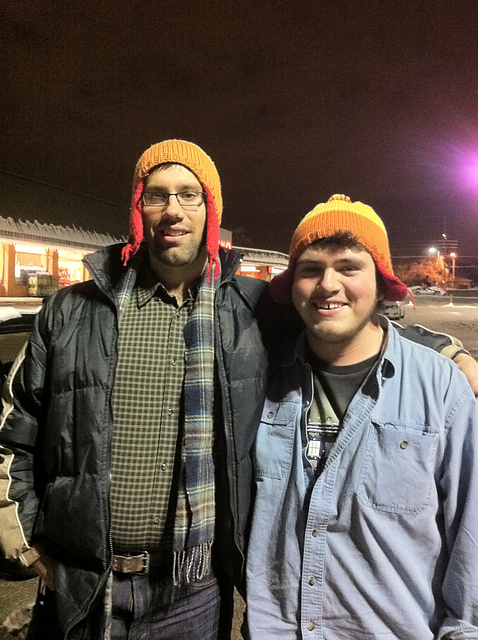 I made a Jayne hat again. This time it was for my middle brother, and I used this pattern, which I think I was happier with. And now for my pride and joy of the whole lot. The pattern is Fightin’ Words by Annie Watts of Wattsolak Designs. 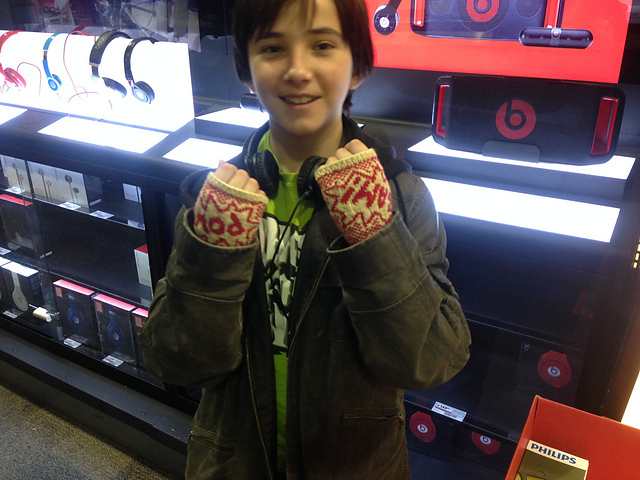 These fingerless mitts were for my youngest brother, who seemed to get a kick out of them. My first true stranded colourwork. A pretty awesome pattern, and a pretty awesome job, if I do say so myself.